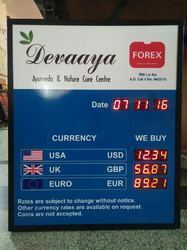 Digital Display systems which is called in general, includes any type of LED systems such as information display systems, production information display systems, weather display systems, head count displays , price display boards Hymns and Lyrics board etc. Information display board is the LED display board, which is highly recommandable for its long lasting effeciency.Leds are known for their durablity and low power consumption. neat and attractive design to suit your aesthetics.Input is done thru keyboard or wireless remote. 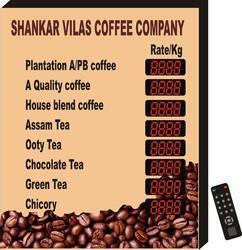 1" character height 4 digit display to display price. digits can be easily changable with wireless remote. 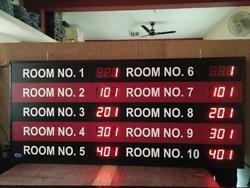 Head count display is used for counting the no of persons getting in. Can be designed with any no. columns & rows. Available in 4,5, 6 digits in slots. Micro controller based technology for very low power consumption. Facility of changing through wireless Remote & option of making unused slot blank. 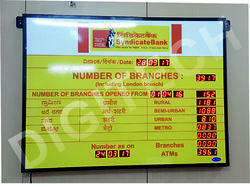 Front designs as per the customer specification with corporate color Logo. Long lasting linear type power supply. 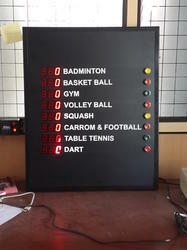 Information display board or the price display board is the LED display board, which is highly recommandable for its long lasting effeciency.Leds are known for their durablity and low power consumption. 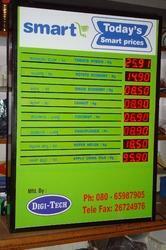 Looking for Digital Display System ?